Louis A. Godey established Godey’s Lady’s Book in 1830 in Philadelphia. Initially, it included mainly articles clipped from British women’s magazines and hand-coloured plates reproducing fashions of the day. Wanting to provide more original content by American authors, Godey bought the Boston Ladies’ Magazine in January 1837 and invited its editor, Sarah Josepha Hale, to edit the revamped publication. For the next 40 years, Hale and Godey commissioned fiction, poetry, and essays almost exclusively from American writers. Among the distinguished authors on the magazine’s literary pages were Nathaniel Hawthorne, Ralph Waldo Emerson, Edgar Allan Poe, Henry Wadsworth Longfellow, and Harriet Beecher Stowe. In the 1880s, Godey’s Lady’s Book featured monthly series of profiles on American presidents. This was the magazine’s item on John Quincy Adams. 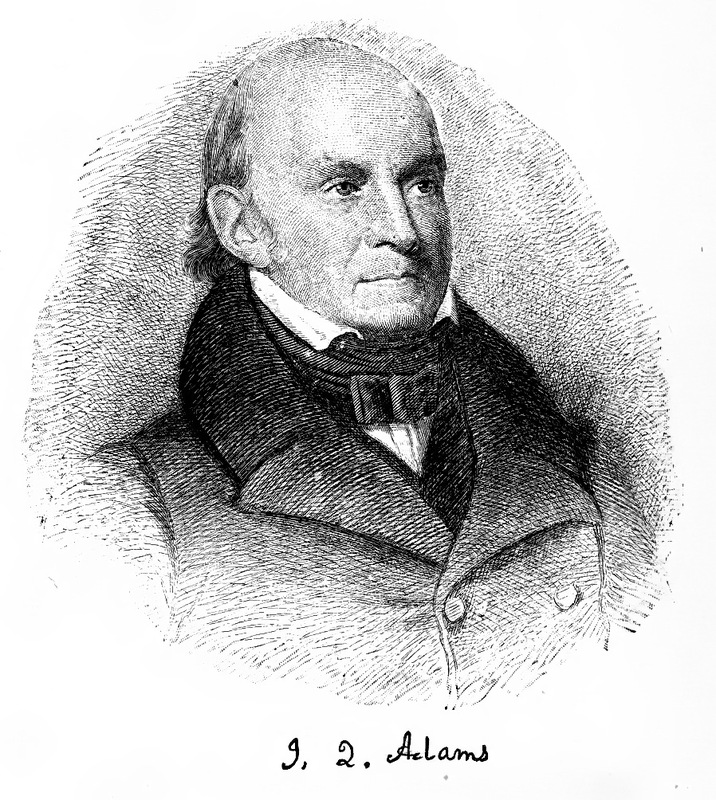 John Quincy Adams, the son of Washington’s successor, and heir to an illustrious name, was born in Massachusetts, July 11, 1767, but in his early youth, having accompanied his father on an embassy to Europe, he had all the advantages of foreign travel and a protracted residence at Paris. He developed a fine literary taste as he grew older, and became a professor of rhetoric in Harvard University, having first engaged in politics to a mild extent. His political career was interrupted by the election of Thomas Jefferson, but he soon abandoned his academical post to pursue it again, and was elected to the Senate by Massachusetts as a strong representative of the Federal party. Later on his views were modified, and he partially fraternized with Madison’s party. During the latter’s administration he was sent on a mission to Russia, and afterward to England, where he took part in the negotiations of peace then pending, and became the adviser of the deputies sent from America to Ghent. The election of Monroe involved Adams’ recall from Europe. During the next four years he became a foremost figure in American policies and in 1825 was elected to the Presidency, Jackson being his powerful opponent. Adams tried hard during his administration to render himself popular with the growing democratic faction, but was unable to secure his seat for more than one term. The next election placed General Jackson in the Presidential chair, and Adams retired to his estate at Quincy, Massachusetts, a place not far removed from Boston. Adams tried hard during his administration to render himself popular with the growing democratic faction, but was unable to secure his seat for more than one term. The next election placed General Jackson in the Presidential chair, and Adams retired to his estate at Quincy, Massachusetts, a place not far removed from Boston. In 1830 he represented that district in Congress, and became such an ardent abolitionist that his continual agitation of the slavery question often arraigned the whole House against him. There can be no doubt that he went to extremes in this matter; for in 1842, with the purpose, it is said, of proving merely in the abstract the right of petition, he presented a petition asking for the dissolution of the Union. The folly of this step was manifest. His object was not clearly understood, and this action was turned against him by his political adversaries. Though one of the most skilled diplomatists and most able of the Old-School statesmen, his influence from this time declined. He died at Washington, on February 23, 1848, while Congress was in session.